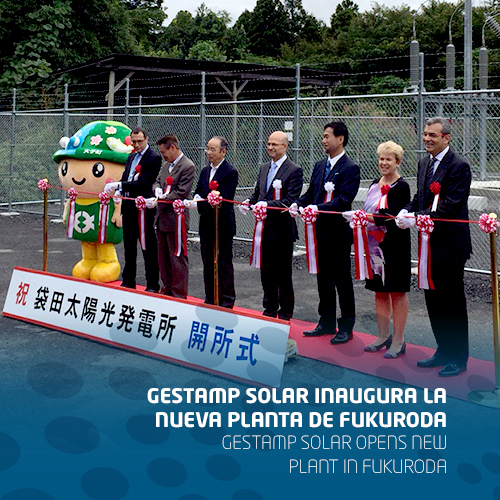 Last September 18th, took place the opening of the new photovoltaic solar plant of Gestamp Solar in Fukuroda, Japan. This is the first project of the company in Japan. The facility has a nominal power of 26 MW, more than 126,000 Yingli modules YL250p-35b multicrystalline and 26 conversion centres composed by 1 ABB 1000 Kw inversor (one per centre) plus a transformer ABB 1100kVA with ABB cells. It is estimated an annual production of more than 37,000 MWh/year reducing emissions in 24,000 tons of CO2/year. Government representatives from Ibaraki’s prefecture assisted to the opening ceremony, as well as members from the Spanish Embassy in Japan together with several companies that cooperated in the execution of the project. Gestamp Solar CEO Jorge Barredo attended the inauguration on behalf of Gestamp Solar accompanied by Japan & Asia Country Manager Keji Yasuoka.